As part of my spotlight promotions for authors, and a blog tour stop, I am excited to welcome Katie O'Sullivan to the blog today! This young adult book is aimed at advanced middle grade and beginner YA readers, and anyone looking for fantasy and adventure with a Cape Cod setting. A perfect young teen beach book for summer on the Cape, filled with adventure, light romance and beautiful descriptions of life along the sandy shores – and beneath the waves. 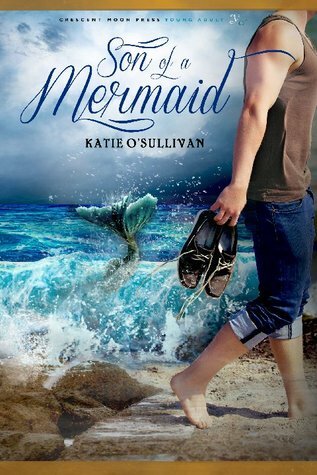 Son of a Mermaid is the first book in a planned series about Shea MacNamara and the undersea world of mermaids and mermen that he discovers off the shores of Cape Cod. For my blog tour stop, Katie has agreed to be interviewed. So I'm very excited to say "Welcom Katie!" Let's see what she has to say! I fell in love with books early on. I’ve been writing stories since second grade, but it took until my own children were all in grammar school for me to get serious about being published. Full-day kindergarten was a wonderful thing! A lot longer than it takes to read them! It depends on the story, and on what else is going on in my life. I finished a first draft of Son of a Mermaid back in 2009, but it wasn’t “ready.” The characters were still developing. On the other hand, the second book about these same merfolk flowed much more quickly, and I was finished in months rather than years. Mermaids have always fascinated me. We spent summers on the Jersey Shore when I was younger, and my friends and I would make up stories about the mermaids who lived in Barnegate Bay. Now my family lives on the shores of Cape Cod, and when my daughter was little we started telling stories about the mermaids who live here, in Nantucket Sound. Not really. I’d probably be a lot more productive if I did, lol. I write when the kids are at school, or at night when everyone’s in bed and the house is quiet. It depends on the season, honestly. My writing tends to slack off in the spring when the weather turns nice and it’s time to plant the gardens. Summer is tough too, with the kids out of school and houseguests arriving. But. If I have something I’m excited about, I’ll find the time to write. The piles of laundry and layers of dust just mean I’m busy writing. For me as a reader, it starts with the characters. I have to care what happens to them, and want to root for them. Then the story line needs to follow a logical course, one that makes sense for the characters. Getting started! Especially now that I’ve written several manuscripts, I realize what a commitment it is to start a new book, both of time and emotions! My first love is YA, and Son of a Mermaid is my favorite book so far! The title character of Son of a Mermaid is Shea MacNamara. When I imagined and wrote him, I infused him with characteristics from both of my sons, so I’m very partial to him. He’s strong and sweet at the same time. Well… up until now, my desk has been sitting in the living room, centrally located so that I can keep an eye on the dogs and kids and whatnot. But. We are currently in the process of renovating our house, so I’m not sure where my writing nook will end up. For now, it’s still in the living room, with a totally distracting view of the contractors ripping up our yard! I like working with small publishers, and the camaraderie with the other authors in the house. All three of my books have been with small publishing houses, and while one turned out to be a bad experience, it didn’t deter me from trying again. There are lots of choices today for authors, and self-publishing doesn’t have the same stigma it once did. But I find it comforting to have a publisher and a network of other authors to work with. My biggest advice is to do your homework and decide what’s the best route for you and your book. My family has been very supportive of my writing. My mom and two of my aunts have been ultra supportive, buying multiple copies to give friends and having their book groups read the novels. I’ve been asked to make a special trip to Virginia talk at one of the book clubs, which I need to work into my schedule, despite the fact that it’s Virginia in the heat of summer! I love reading, walking on the beach with my dogs, spending time with my family, and watching any sport my kids are playing. I’m an avid (and noisy) soccer fan and almost understand the game – it only took 14 years of standing on sidelines, lol! The best advice is to write. And keep writing. If it means joining a class or a group to keep you going, then join. It’s good to be accountable to someone other than yourself. And once you have enough words on the page, it’s good to have someone else to read it and give you an honest opinion. I’m a voracious reader, and it’s hard to single out one book or one author. Some of my favorites at the moment include Cassandra Clare, Scott Westerfeld, and the Harry Potter series. I also love John Green, Eoin Colfer’s Artemis Fowl books, and Heather Brewer’s Vladimir Todd series. I’ve also been reading a lot of the books by the other Crescent Moon Press authors this spring and am truly impressed. Jody Kessler’s Death Lies Between Us and Lindsey Loucks’s The Grave Winner were two of the most original stories I’ve read lately! When I first started writing seriously, I joined a group where we each brought pages to read every week and critiqued each other’s stories. I found that really helpful in the beginning, to keep me on track. I was sad when the meeting times stopped fitting into my schedule and I had to drop out. My middle child has been the most helpful with the mermaid series, as my primary beta reader, biggest critic and biggest cheerleader. Now that he has a girlfriend (!) he’s even helpful with the romance parts of the story, all the emotional bits he used to gloss over, lol. I recently signed a contract for a follow up to Son of a Mermaid. The working title is Blood of a Mermaid, and it follows the same characters we meet in the first book. I don’t have anything new started because I know the editing process on that book will start soon, and I’m still busy promoting the first book. Thanks so much for inviting me to your blog today! This was a fun interview! Thanks so much for stopping by today, Katie! It's been so much fun having you with us! Katie has generously offered not one but TWO giveaways with her blog tour! So scroll down and enter via the rafflecopters listed below! Katie O’Sullivan lives with her family and big dogs next to the ocean on Cape Cod, drinking way too much coffee and inventing new excuses not to dust. Her children attend Harwich Middle School and Nauset Regional High School, and her minivan logs thousands of miles without ever crossing the bridge. She writes YA and romantic suspense novels. For the last four years, she’s worked as the editor of CapeWomenOnline.com magazine and writes “The Write Way” column for the magazine. 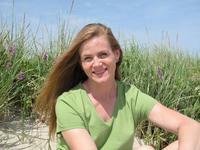 She hopes her debut YA novel, SON OF A MERMAID, will make a big splash this summer, engaging young readers with a Cape Cod tale of a boy who discovers both his roots and his destiny far below the waters of Nantucket Sound. Thanks for inviting me over today, Brooke! It's been great meeting you! Thanks for the interview and giveaway!!! :) Looks great! Looks like a great summer read and the necklace looks awesome. Thank you for this chance to win. Great review and I probaly would not have got it to read just from the title and synopsis, but with your review, it does give more in depth information that now I would love to read Son of a Mermaid. By the way, thanks for another great giveaway and I hope I win. I don't normally get drawn to water-based stories, but, dude, this cover is beautiful. What a beautiful necklace. Thanks for the opportunity! I am excited about the book, the cover is beautiful. thanks for the awesome giveaway! I would love to win! Son of a Mermaid sounds like a great summer read! Thanks for the great giveaway!